Containment booms surround sunken tugboat on the Big Sandy River in West Virginia. While the City of Ashland is no longer supplying water to Kenova, WV, response efforts are still underway to deal with an oil spill along the Big Sandy River. The leakage resulted from the sinking of a tugboat named Gate City last Wednesday morning causing oil to spread two miles from mile marker 7 to mile marker 5. 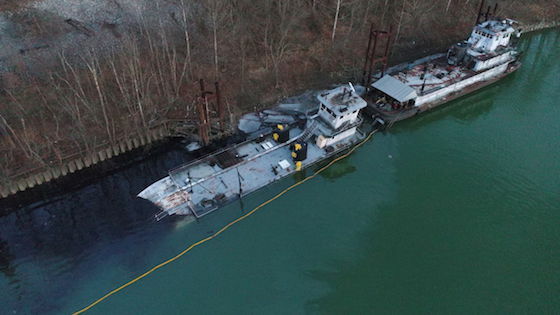 The 140-foot boat still remains in the river near Butler, WV. The city was providing water to Kenova to insure the town was not affected, said Ashland Public Information Officer Joanna King. She also said since Ashland’s water intakes are deeper in the river than Kenova’s, Ashland was not impacted by the oil leak. King said water was provided to Kenova up until around Sunday morning when the city was able to start drawing water on its own. According to a news release from the U.S. Coast Guard, the amount of oil that could potentially be released from the tugboat was initially 5,000 gallons. It has now been revised that approximately 1,300 gallons released into the river. The release also stated spill response teams have recovered 800 gallons so far. Public Affairs Officer Chris Blank of the U.S. Coast Guard Marine Safety Unit in Huntington, WV, said the oil has been recovered with the use of vacuum truck and a drum skimmer, which he described to be similar to a pool skimmer. Containment booms are also surrounding the contaminated areas. Blank said responders are continuing cleanup operations the best they can with the current weather conditions, adding there has not been any new contamination. “Hopefully in the next couple of days if ice breaks and the river levels go back down we can safely get our crews onto the river to start doing more,” said Blank. Heavy lift equipment from Cincinnati has been contracted and will be used to salvage the boat. The company is waiting for water levels in the river to lower before traveling to the scene, Blank said. Blank said the cause of the incident is still unknown, noting it will probably not be discovered until the vessel is salvaged. The Coast Guard, along with West Virginia Department of Environmental Protection and Kentucky Department of Environmental Protection, are investigating the situation.